Do you drink soda drinks? How often do you drink it? When I was young, I was an avid drinker of Coca-Cola and other soft drinks. Actually, I was pretty much a coke addict. I could never get past a day without drinking Coca-Cola. It was normal for me to have days when I would finish almost a whole 1.5 liter coke bottle. As I grew up, I became more conscious of the need to be healthy. I started to relook into my diet, including my staple drink of Coke and soda. Over time, I realized Coke is actually quite detrimental to our health - so much so that I wonder why it even became such an ubiquitous drink! In my pursuit for a healthier life, I made the decision to quit drinking Coke at 18. I started to slowly forgo Coca-Cola and soda drinks. When I reached my early 20s, they were almost completely out of my diet. In the rare occasions where I do drink it, I would find the taste excessively sweet, acidic and unpalatable. When I look back, it was hard for me to even fathom myself putting so much of this chemical junk into my body when I was younger. Here is a list of 5 top reasons why you should just quit drinking Coca-Cola and soda drinks. 1. Counteractive to Weight Loss Efforts. One 330ml can of Coke contains around 160 calories. Assuming you drink one can of Coke everyday: that’s 4800 extra calories every month or 1.4lbs. In a year, that adds up to 57,600 extra calories or 16.8lbs! Granted, you will not be gaining an absolute 16.8lbs since our body metabolism adapts accordingly from consuming more/less calories, but you will still be gaining an extra layer of weight just by drinking Coke/soda drinks over other healthier, lower calories options. 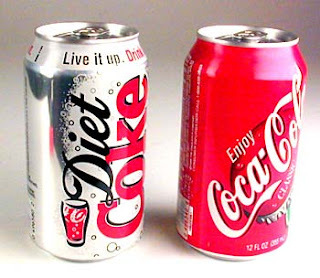 Contrary to popular belief, Diet Coke/soda is counteractive to weight loss efforts as well. I used to think Diet Coke should be a diet staple when I was trying to lose weight, which I later I found out wasn’t the case at all. Diet soda has been found to increase possibility of weight gain by 41%. While there are many theories explaining this counter-intuitive finding, I thought to test this out for myself. I tried the following two scenarios in separate stretches of time: one drinking diet coke and another drinking just water. The result? I found a much higher tendency to go into binging attacks when I drink diet coke. The most plausible explanation I found is artificial sugar in diet sodas confuses your body when it tastes something sweet that isn’t sugar. As a result, it makes your body crave for actual, sweet food. So while you may be taking in 0 calories from drinking diet soda, there is a higher likelihood you will grab consume more food after drinking the soda, which then leads to weight gain. 2. Stains and corrodes your teeth. Coca-Cola and sodas with colorings stain your teeth, as many are already aware. In addition, they have been shown to destroy 10 times more teeth material than fruit juices in just the first three minutes of drinking in a test. Slices of enamel were placed in Coke and other carbonated drinks for 48 hours, where there was a 5% weight loss of the enamel in the end. The high acidity content (pH 2.0~4.0) causes corrosion of your enamel. Granted, lab conditions do not mirror reality, but the corrosive effect of Coke on your teeth is something that accumulates over time. Coke and soft drinks contain caffeine, which is a diuretic. A diuretic is a drug that speeds up the rate of urine production - meaning it removes water from your body. While you can get your thirst quenched when drinking Coke, you do not get as hydrated as compared to if you just drink pure water. 4. Artificial stimulant which alters your mind. Caffeine is also a psychoactive stimulant drug. It affects the central nervous system and alters brain function, resulting in temporary changes in perception, mood, consciousness and behavior. By increasing the levels of adrenaline (a stress hormone) in your body, you end off setting off feelings of anxiety and tension in your body. Instead of being able to operate as a fully conscious being, you end up having less control of your thoughts, emotions and behavior. I noticed that whenever I do drink Coca-Cola or soda, my mental thinking is not as clear. It feels as though my thoughts become more rapid, jumbled and haphazard. Even though I’m supposedly more alert, I’m not fully in control of the higher faculties of my mind. It feels more like my mind is operating by itself and my conscious self is only allowed to observe in the background to give limited inputs. If this was in the past where I was drinking Coke everyday, I would never have been able to make this observation. However, drinking Coke after being Coke/soda-free for many months made the contrast very stark to me. 5. Causes insomnia and sleeping disorders. The most important long-term problem (of caffeine) is the effect (it) has on sleep. Adenosine reception (sleep inducers) is important to sleep, and especially to deep sleep. The half-life of caffeine in your body is about six hours. That means that if you consume a big cup of coffee with 200 mg of caffeine in it at 3:00 p.m., by 9:00 p.m. about 100 mg of that caffeine is still in your system. You may be able to fall asleep, but your body will probably miss out on the benefits of deep sleep. The last time I drank (diet) coke, it kept me up all night until 6am, even though I tried turning in at 2am. My mind just went into overdrive mode and I could not sleep even though my body felt physically tired. If you drink coke/soda and you are finding it hard to manage your sleeping schedule, it might be the caffeine causing the problem. The problem is further aggravated if you are a naturally hyperactive person too (like me). While you may appreciate caffeine for keeping you awake for a particular morning meeting or presentation, bear in mind that the boost is only temporary and at the expense of the natural functions of your mind (see point 5 above). While you may feel more alert after a dose of caffeine, it is just a stimulated feeling. Whenever I consume caffeine, I feel like my mind has been pried awake beyond its desires. Even though the lights are on in my brain, I can only perform low level tasks which do not require much thinking. Higher functions of my mind seem to be beyond me. I pretty much feel like a zombie walking around with limited mental capacities and a body heavy as lead. So, how can you quit coke and soft drinks? (1) Plain water - (nearly) free, healthy, gives a fountain of benefits. Doesn’t get any better than this. If you are to dine outside, plain/mineral water will always be a reliable option. (2) Fruit and/or vegetable smoothies which I make myself using my blender. I would recommend not to substitute it with coffee - the higher caffeine levels makes it an unhealthy drink as well (more than 2 times compared to Coke, on a per oz basis). I personally do not drink coffee because of that. I have also never been fond of the taste of coffee anyway - it has a bitter undertone which does not sit so well with my taste buds. 2. Get rid of the soda drinks in the fridge. Remove all traces of Coke and soda drinks inside your fridge. It may seem like a waste but it’s better than downing them into your body and ruining it. 3. ….And stop buying them home. After you eliminate the remaining traces of those drinks, don’t purchase them anymore! Tell your family (or housemates if you live with other people) about your goal and tell them to stop buying the drinks. Better yet, educate them on why they should quit drinking and get them to quit as well. If this is not possible, ask for their help to put the drinks out of your side. 4. Tell your friends of your goal. This way, you are accountable to them as well. Your friends can serve as gatekeepers of your decision. 5. Mentally block out the soda section in the menu when you dine outside. Since you are going to give up sodas, there is no need for you to look at the soda section. This prevents any second thoughts. 6. Ensure you have enough sleep. So you do not have to resort to drinking caffeinated sodas to keep you awake later in the day. 7. Keep a record of the days you go without drinking Coke or sodas. Mark it on your calendar if you have one. When you start seeing a whole succession of soda-free days, you will be tempted to keep the ball rolling. 8. Persevere. As you start cutting away Coke and sodas from your life, you may find withdrawal symptoms in the first week (depending on how heavy a drinker you were before). These symptoms may come in the form of restlessness, anxiety, cravings to drink again. Push through! They will start melting away after a few days in the face of your determination. Try it and see how it works for you Chances are, as you start freeing yourself of Coca-Cola and soda drinks, you will find your body feels so much more refreshed and cleansed. You can feel yourself becoming healthier. Your thinking becomes clearer as well.